What Are The Causes Of Exercise Induced Compartment Syndrome? Also known as exertional compartment syndrome, chronic compartment syndrome etc, this is a condition that causes people to experience muscle pain. Usually relieved by rest, patients suffering from the syndrome often complain of pain after undergoing a period of exercise or activity. Depending on the severity of the condition, patients run the chance of having their activity levels reduced or limited because of this. This condition cannot be confused with acute compartment syndrome, which requires surgical intervention to get better. is largely due to increased activity or exercise. To better understand the phenomenon, let us examine in detail what happens when there is an increased pressure within the muscles. The fascia is a tight tissue that encloses and protects our muscles and normally, there is enough room within that enclosure for the muscle to function properly. Blood flow to the muscle increases, when activity levels of a person are also increased. This in turn, leads the size of the muscle to increase as well! Normally, during exercise, the fascia easily accommodates the increase in muscle size, but in some people, this isn’t the case. The fascia of patients suffering from exercise induced compartment syndrome becomes too tight during such activities and constricts the muscle enclosed within it. Where Does The Syndrome Affect More Frequently? The leg is considered to be the most common location where exercise induced compartment syndrome strikes, especially around the shin bone area. Patients who complain about the symptoms are usually runners and cross-country skiers. While rare, the syndrome can also develop in the thigh, forearm, and other muscle groups of the body. As with every condition, exercise induced compartment syndrome is also not free from pain i.e. a symptom that is more commonly felt during activity or exercise and is quickly relieved with rest. Other symptoms that patients might experience are a tingling feeling, or numbness which is largely due to lack of blood flow to the nerves located in the area. Determining the accurate cause of these symptoms is done by measuring pressure buildup, within the muscles of the compartment that’s affected. The initial measurement is made when the patient is at rest, followed by a repeat measurement after the patient is prompted to do an activity such as a quick run until the pain starts again. The two measurements are compared and if the readings of the measurement taken after the run are higher as compared to the initial reading, the diagnosis of exercise induced compartment syndrome is made. To relieve the symptoms associated with this condition, a period of rest may be recommended from the doctor as well as putting a temporary stop to the activities causing the symptoms. Surgery will be needed if the symptoms persist even after rest. 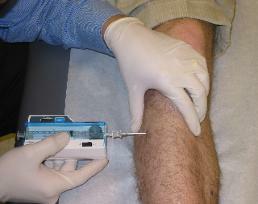 The procedure is quick and typically extremely effective with a sports medicine doctor in Phoenix. Dr. Adam Farber is a top orthopedic sports physician in Phoenix and Scottsdale who treats exertional compartment syndrome along with all types of ligament and tendon injury. Call Phoenix Shoulder and Knee today at (480) 219-3342!